Renowned early 20th Century golf course architect Alister Mackenzie observed that “the chief object of every golf architect or greenkeeper worth his salt is to imitate the beauties of nature so closely as to make his work indistinguishable from nature itself.” Nearly 100 years later at The Course at McLemore on Lookout Mountain, Georgia, golf course architect Bill Bergin remains focused on reflecting the natural beauty in the setting of this breathtaking mountaintop course. Last month, Bergin was engaged by the leadership Scenic Land Company to bring new life into the Canyon Ridge course and to begin the process of redesigning it to accommodate its growing residential community as well as the planned 180-room luxury resort hotel and conference center. On a recent scouting visit to McLemore, we sat down with Bill Bergin to get to know him a little better and to get his thoughts on The Course at McLemore course and how he plans to approach this unique property. What made you fall in love with golf course design? My father is in the insurance business. And anybody who knows insurance knows that golf plays a big role in the insurance business. We were members of a club that did not allow children to step foot on the grass until they were 10 years old. This was not a high-end, stuffy club; this was a middle of the road club in Maryland. But you were still not allowed to step foot on the grass until you were 10 years old. That rule created this desire in me that has never left—that I couldn’t wait to put my foot on that perfect green grass. Today, I still get emotional about the smell of cut grass in the morning or the shadows late in the afternoon on a golf course. That just goes right to my heart. And there’s no place I’d rather be. Golf has grabbed me. And that’s what I want to do for more people. I really want to create a situation and create golf courses where people just want to be there. I do this by trying to appeal to the golfer on multiple levels—intellectually, in the heart, and physically. When did your career as a golf course architect become more serious for you? In college, I became interested in golf course design. I was a great mapper of golf courses as well as a solid player. This was before having range finders and great yardage books. We just created our own. You could buy yardage books on the PGA Tour, but I always augmented them with my information. When I got into the design business, I found it very interesting how golf course design parallels competitive golf. As a competitive golfer, you visualize a shot, you execute the shot, and you’re instantly rewarded with some feedback. As a designer, there’s even more feedback and it’s even better. Here’s why: we get to a piece of property and we start imagining the golf shots on that piece of property. Then we draw that up on a plan. We take that plan even further into construction drawings, with grading plans being the most important aspect of that. The detail of that shot you have imagined in your head starts to come to life on paper. Then we get to go out and build it and it all starts coming to life. We’ve visualized it. We’ve drawn it. We’re building it. And then we get to play it. And that is just like playing professional golf, but even better because the course is permanent. It lasts. You know, if I finish fourth in the Provident Classic, no one cares. But they will always care about Canyon Ridge. It is here and it is going to last. And so, that’s even more rewarding. That’s why for the last 27 years now, I can’t wait to get up in the morning and get to the next project, get my feet on the ground, get a little dirty, and see a course come to life. You were a professional golfer for seven years, competing in three U.S. Opens and two British Opens. What is one of your stand out experiences from that period in your life? My top professional golf experience was probably the best round of my career. I was fortunate to qualify for the 1984 British Open at Saint Andrews. I was 25 years old and was playing on the first version of what is today’s Web.com Tour. I decided to go to Europe and try to qualify for the British Open, which I did. The qualifying is a two-round qualifier on Sunday and Monday. And by Monday afternoon I was in the British Open. The British Open starts on Thursday, so I had two practice rounds. There’s no Pro-Ams in the majors, so I was able to play practice rounds on Tuesday and Wednesday. I was playing very, very well and had finished second in an event. I shot the course record in the qualifying at a course called Lundin Links. So, I knew I was playing good golf. But I had shot 75-73 at Saint Andrews and made the cut on the nose. On Saturday, I tee off very early and shoot 66. And at the time — this was 1984— the course record was 65. I was aware of that, but what was really exciting was, I get to 6 under through 16 holes, and the Road Hole is number 17. I hit every green in regulation that day, and that is not a big feat at Saint Andrews as other courses because the greens are giant. Yet, it is still an accomplishment. And then I three-putt 17. Of course, I’m disappointed. Then I play a nice drive off of 18. It’s into the wind, so we’re not driving it near the green. I hit my second shot about two feet from the hole. The gallery there is a horseshoe just loaded with people. I got a standing ovation from the time my ball landed on the green until I marked it. They didn’t know who I was, but they knew my score. I literally got goosebumps. It was a moment. It was just a moment that you can’t…I’ll never recreate it. That was equal to the low round of the week. Tom Watson shot 66. Ian Baker-Finch shot 66. And I shot 66. So, to equal the best round of the British Open, and to do it with a birdie in the last hole, with the crowd recognizing it, was quite a thrill. As a golf course architect, how do you make a golf course more playable for seasoned amateurs as well as for beginners? So, every course that I work on personally, two things happen. The course gets harder for the best players and easier for the typical golfer or the recreational golfer. That is something that we’re really proud of, and I give that talk often. People look at me a little sideways like, “How can you possibly do that?” Yet, we’ve done it over and over and over for the last 20 years. The reason we can do it is partially my background. I played golf professionally and saw golf at the highest level. Then I taught golf for three years back in the 80’s. I gave eight to ten lessons a day to recreational golfers, so I understand the difference in how a golf course impacts the recreational player and the top player. What impacts the best players is different than what impacts the recreational players that we’ll have at The Course at McLemore. Most golfers play the game on the ground. The best players play it in the air. Because everybody else plays the game on the ground, what happens around the green’s complex is key. Allowing players to navigate, giving them an option where they can choose a challenging route or a more safe route—that gives them the impression that the golf course is fair. They might take the challenging route and be unsuccessful, but they don’t blame the course or the architect. They know it’s on them, as long as they have an option. At The Course at McLemore we’re going to create options where people have an ability to challenge a hole or play a little bit more conservatively, but they’ll feel that the golf course is there for them. It’s fair, and it’s fun. So, that’s one of the things we’re going to do. The secret is on the ground. In this course, especially. What are the current strengths of The Course at McLemore? Well, I think the first thing that you notice is when you come down the entrance road, you get this view out over the 18th green to a series of hills in the background, mountains in the background. They’re just layered out there for you, so it just sort of ramps up your anticipation of what’s to come right there with that first impression. That’s very exciting. We have a good golf course. We have a dramatic site. We want to match those two things a little bit better. 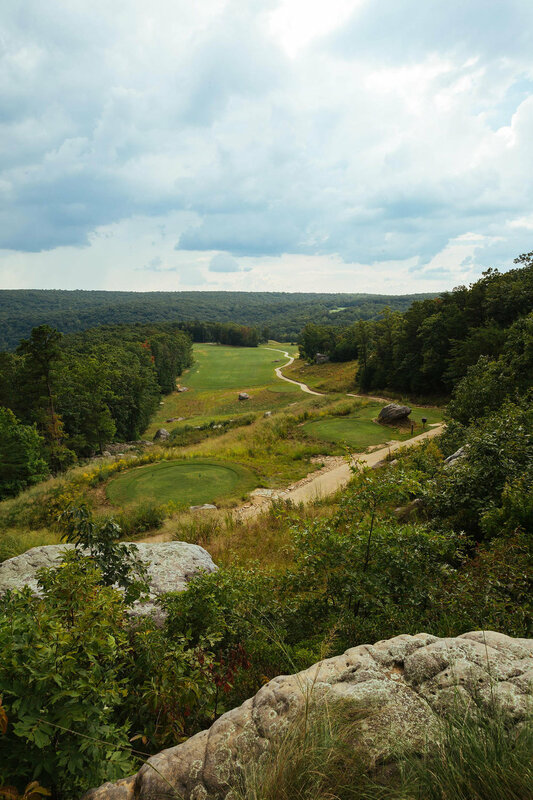 Are there some holes and fairways that are stronger than others at The Course at McLemore? It’s interesting. The original designers took the 1st hole and the 18th hole and, they used the edge of the mountain on both of those holes. So, you begin dramatically and you finish dramatically. We actually want to take the first hole even closer to the edge. We want to make you stand there so that you basically do a 360 degree turn and say, “Wow!” That’s your start of the day. We want to do the same thing when you finish the round on the 18th. So, on number one, you start with an elevated tee shot. There’s not a lot of fairway definition right now, and it’s actually quite tight and too intimidating, especially as a resort course. So, we’re going to make that a little bit more user friendly. We’re going to make it a little bit more defined, so people understand the hole. Then, when they get to the green’s complex, they’re going to go, “Wow!” That’s our goal to start the round. We do have some very dramatic holes as you play throughout the golf course. I think number two is an excellent hole. It’s, again, from an elevated tee, looks down into a valley that has a beautiful lake, and then the green sits across the lake on the other side. It’s a bold start to the golf course. It sets a strong tone. I think it’s one that gets people excited. But then there are holes like number three, which is underwhelming. It needs to be uplifted to fit this role that we’re looking for with this property. A great golf course sort of ebbs and flows between challenges and opportunities. We will do that here. We will have plenty of challenging holes. We’ll also have plenty of holes that you can take advantage of to actually improve your score. But, all of that needs to fit together so it’s an experience that keeps the player interested. And each time he or she gets to a new spot on the golf course, they’re impressed. We will look at that throughout the whole golf course. One of the things that I think you’re known for is your approach to bunkers. How do you compare to someone like Tom Fazio, whose bunkers are a little out there? Tom Fazio bunkers are very dramatic. They’re very eye-catching. To me, they go a step too far in that they dominate the scenery. I believe the bunker’s job is to highlight the scenery. You want the greens to be the star of the show. We want the bunkers to highlight and lift those greens up, not dominate or overwhelm them. There’s a fine line there. Our bunkers are going to make the golf look better, yet still paint this gorgeous picture. Then our bunkers are also very maintenance friendly, which to me, just makes perfect sense. What I mean by that is the sand doesn’t wash; the bunkers are very consistent. The player will find from bunker to bunker to bunker a consistent sand quality and performance. The shot values will be consistent. And the staff who has to take care of them will like it because there are no surprises. Each location has its own unique terrain, climate, soil and conditions. How do you design a course to reflect its environment? I’ve played over two hundred professional golf tournaments around the world, so I’ve seen a lot of golf. Each course I’ve played is unique. And when managed and understood properly, the land helps guide the design. For example, we currently have three projects underway in Atlanta. If you went to all three of them, you would know they were cousins, but they’re not brothers and sisters. There is an element that you go, “Yeah, they’re related, but they’re different.” They may look the same, but they will be different. You’ll see unique aspects to each course that are specific to the land. The bunker style at The Course at McLemore will be a grass-faced bunker with sand in the bottom, but it will have really interesting movement to the grass face. The arc of a bunker has two aspects: the sand line creates an arc, and then, for our bunkers, the crestline creates another aspect of arc. And they don’t have to move parallel to each other. They can actually vary in height and angle. And that creates this just beautiful, bold look. We looked at bunkers at The Course at McLemore and found that some of them are just flat scoops. They’re like someone took an ice cream scoop and just took a little scoop out of the grass. Our bunkers are three-dimensional and really get your attention without dominating the golf hole. So, we’re proud of our bunkers and that will be a big deal at The Course at McLemore. In the master planning process, we’re going to look at this golf course from top to bottom. Our goal is to make it the best it can be. What do you find inspiring about a great golf course? I also believe that yardage diversity is part of a great golf course. Too much is put on today’s world about length, because the tour players hit it so very far. But that’s less than one percent of the golfers out there. But to mix with that ebb and flow of opportunity and challenge is yardage diversity. For example, the third hole here at The Course at McLemore is a very nice, short par three. So, conversely, number eleven is a pretty long par three. We want that great mix of lengths, from the shortest hole to the longest hole, all of them being fun, all of them where people look forward to playing them. We want our players to experience a great mix where they can use all their clubs. It’s a cliché, but we literally will set the golf course up so that players will use every club in their bag. We will lengthen this golf course, and we will shorten it. We will work on both ends. We literally want to appeal to every person who comes down the entrance road.